The air is getting cooler (if you're up North, that is), it’s actually starting to get dark around the kids' bedtime, and some places have even gone real forward-thinking and busted out Halloween decorations (looking at you, Michaels). With back-to-school quickly approaching, it seems like everyone is gearing up for the big day. Office supplies are on sale, Pinterest is flooded with first-day-of-school gifts for teachers, your kid has grown yet another 2 inches seemingly overnight, and you feel the invisible pressure to prepare. Sure, we know the basics: Buy school supplies, and… and… um, wait. We forgot. Maybe get haircuts for everybody? Oh, crap. We've forgotten everything haven't we? If you’re finding it a little tricky to switch your brain out of vacation mode, don’t panic. 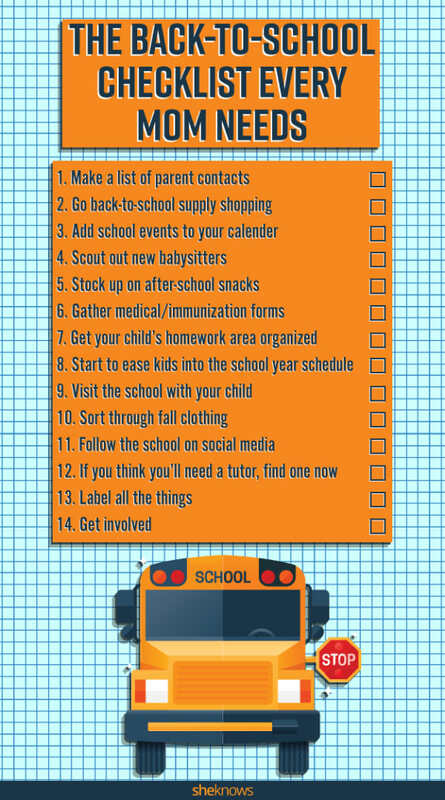 We've put together the one back-to-school checklist every parent needs to tick off before the school bus arrives. From adding school events to the calendar and stocking up on after-school snacks to finding a tutor (yes, before school starts), this list features everything you've forgotten and more. Because you know you forgot something. It's always a good idea to make a list of parent contacts for some of your child's classmates. You never know when you'll need to phone a friend in hopes of, say, printing out a research paper last-minute when your printer runs out of ink right before school starts. Not that that's ever happened to us. Let kids pick out their own fun supplies, whether that means they're covered in Paw Patrol or in Run-D.M.C. It might drive you crazy, and you might prefer the neutral folder set (you know, so as not to distract from all the learning that will be going on), but guess what: They're not your school supplies. If your kid picks out their own supplies, they are more likely to use them — and not forget them in their locker. Shopping can be stressful, but if you can’t find the "three-pack of name-brand highlighters" on your school’s list? Don’t sweat it. A highlighter is a highlighter. Sure, you won't be able to add every single thing for the whole year, but you can definitely put school breaks, state testing, etc., in your calendar so you're not that one parent who drives their kid to school at 7 a.m. on a Monday only to find out it's staff-development day and there is no school. Try to balance your kids' favorite snacks with some healthy options, and let them choose one of each when they get home from school. Because really, don't we all deserve a little treat when we get home? 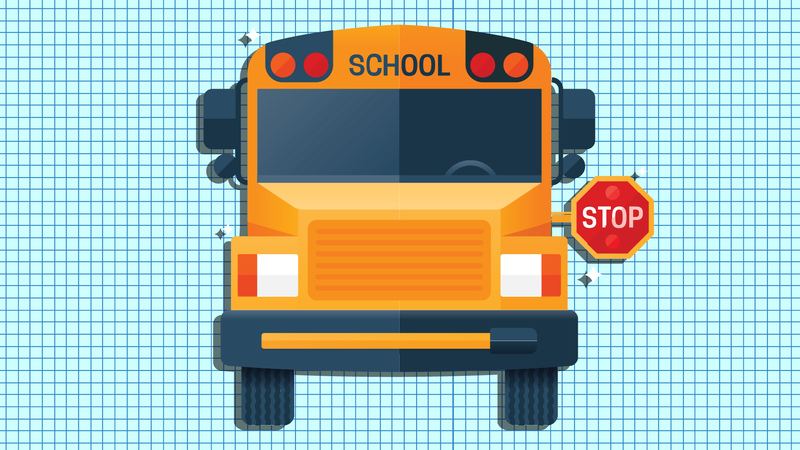 Many parents forget to get their kids' forms from the pediatrician to the school prior to the first day — and depending on your school's rules, it's possible your child won't be allowed to attend school until those forms are in. So maybe let's highlight this one on the list, okay? Can you get any work done when your workspace is a mess? Neither can your kids. So start their year off right with a clean and uncluttered desk. Dump out the dust and hole-puncher circles from the drawers, sharpen the pencils and find a place to keep a water bottle handy so they stay hydrated and focused. No one is saying it's going to be easy to get kids to wake up at the crack of dawn — or go to bed earlier so they can — but hey, it's going to be a lot easier if you do it little by little instead of waiting until their alarm goes off on the first day. If school is something that causes your kid anxiety, help quell that fear with a tour of their school and classroom when the building is devoid of throngs of students. Show them where their class is; walk them through their schedule; check out the bathrooms, their locker and the nurse's office. For some reason, it's always after you've bought a complete fall wardrobe that your kid decides to grow 2 inches in one month, totally foiling your plans of going six months without clothes shopping again. So before school starts, make sure everything still fits — and clear out some space in their closet if it doesn't. Chances are, your school has a few social media accounts, which will keep you up to date on the goings-on that take place and also provide alerts for early dismissals, cancellations or any emergency at the school. If the school has a text or email alert system, sign up for that as well so you'll be sure to stay in the loop. If you're lucky enough to be able to afford a tutor, find one now. Because if you wait until your child is struggling, they'll have to play catch-up. If you find a tutor from the get-go, that person can assist your child with their homework and help them study so they won't fall behind. If a tutor just ain't gonna happen? There are plenty of alternative learning solutions to help you out. Dear parents: You may think you don't need to label stuff because your child is the only Emily in the class — or because you're sure you'll recognize your child's belongings. Well, sometimes you won't. Or it will be the exact same coat, but you won't notice it's two sizes too big until you get home. Or you'll unpack their lunch box only to find remnants of a lunch that wasn't the lunch you packed that morning. Label. All. The. Things. Feeling the need to be more involved?